5 Great Free Kindle History Books for Sunday! *We Were Soldiers Too: The Unknown Battle to Defend the Demilitarized Zone Against North Korea During the Cold War (Deal, Not Free) by Bob Kern, Brian Hawkins. Price: $2.99. Genre: History Deal, Sponsor, Korean War. Rated: 5 stars on 3 Reviews. 169 pages. ASIN: B01I0J0T9O. The History of England, from the Accession of James II – Volume 2 by Baron Thomas Babington Macaulay Macaulay. Price: Free. Genre: England. Rated: 4.3 stars on 6 Reviews. 694 pages. ASIN: B0082XH21M. Posted on July 31, 2016 Author KibetCategories Free Kindle History Books, HIstorical, HIstory, WarLeave a comment on 5 Great Free Kindle History Books for Sunday! 8 Superb Free Kindle History Books for Saturday! 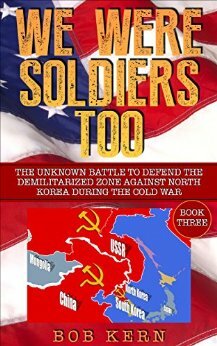 *We Were Soldiers Too: The Unknown Battle to Defend the Demilitarized Zone Against North Korea During the Cold War (Deal, Not Free) by Bob Kern, Brian Hawkins. Price: $2.99. Genre: Deal, Sponsor, Korean War. Rated: 5 stars on 3 Reviews. 169 pages. ASIN: B01I0J0T9O. Posted on July 30, 2016 Author KibetCategories HIstory, MilitaryLeave a comment on 8 Superb Free Kindle History Books for Saturday! 7 Excellent Free Kindle History Books for Friday! Excellent Non-fiction account by the DMZ Soldiers! *We Were Soldiers Too: The Unknown Battle to Defend the Demilitarized Zone Against North Korea During the Cold War (Deal, Not Free) by Bob Kern, Brian Hawkins. Price: $2.99. Genre: Sponsor, Korean War. Rated: 5 stars on 3 Reviews. 169 pages. ASIN: B01I0J0T9O. *Ramesses II: The Greatest Pharaoh of the New Kingdom by Duncan Ryan. Price: Free. Genre: Sponsor, Egyptian History. Rated: 5 stars on 1 Reviews. 74 pages. ASIN: B01J0Z0NT8. Posted on July 29, 2016 Author KibetCategories Free Kindle History Books, HIstorical, HIstory, WarLeave a comment on 7 Excellent Free Kindle History Books for Friday!